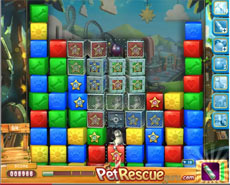 Pet Rescue level 605 is not difficult to be passed. You have just to destroy the wire creator machine, using the rocket booster at the suitable moment. After that destroy the line of metal boxes, under the pets, with one for the half line blasters there are in the same line. After this point you can rescue the demanded number of pets, clearing the blocks under them, using the balloons and the line blaster of the level and the rocket that will be activated once again since then. Still find pet rescue level 605 difficult to pass? The following video shows the right strategy you have to follow in order to beat it.